Michael Escarda, PT earned his Bachelor’s Degree in Physical Therapy at Cebu Doctors’ University in 2016. His internships had a strong focus on orthopedic, neurological and sports medicine. 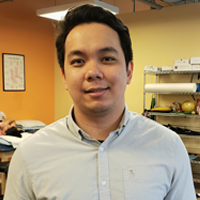 He is currently a certified FMT provider (RockTape) and is a firm believer in using the therapeutic taping method as an adjunct to Physical Therapy. He is also planning on pursuing his Doctorate in Physical Therapy very soon to provide the best care for each and everyone of his patients.